Offered at: All clinic locations. An X-ray (radiograph) is a test that helps physicians diagnose and treat medical conditions. It is the oldest and most frequent form of medical imaging, used to examine a variety of body parts. A body part is exposed to a small amount of radiation, producing a black and white image. Digital X-rays are another form of X-ray imaging, where digital X-ray sensors are used instead of traditional photographic film. Several advantages include the ability to digitally transfer and enhance images, as well as permanently store images electronically. Additionally, the X-ray technologist can tell immediately whether the image is acceptable when compared to the conventional film X-ray. 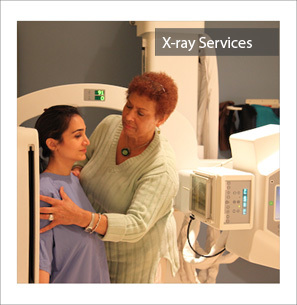 General X-ray examinations require no preparation and are done on a walk-in basis. You may be asked to change into a gown for some procedures. The technologist will bring you into the room, position you appropriately, and take one or more pictures. You will be asked to wait in a changing room for a few minutes until your films have been checked. Examination times vary depending on the number of views requested by your doctor. For example a chest X-ray may take 5 to 10 minutes whereas a spine series could take up to 20 minutes.